October 15, 2017 /29 Comments/in AltRight, Featured Articles /by Robert S. Griffin, Ph.D.
New York: Columbia University Press, 2017, 218 pp. With any book, it helps to take into account who wrote it and who published it. George Hawley is an assistant professor of political science at the University of Alabama. Assistant professor is the lowest professor rank. Hawley’s a young faculty member, in his early thirties by the looks of his picture with his young child on his website — just starting his academic career, or so he hopes. Assistant professor is probationary status. At the end of six years typically, you are checked out by senior faculty and administrators and if you pass muster, you get promoted to associate professor and granted permanent status, or tenure, at the university. If you don’t get tenured, it’s the help wanted ads over breakfast, so the stakes are extremely high for young Hawley. (With tenure, there’s just one more promotion, and it can be anytime, or never, to full professor.) A must for getting tenure is a good publication record — publish or perish is real — which means Hawley had to give the editors at Columbia University Press what they wanted or he was dead in the water. All to say, don’t expect an assistant professor to take intellectual or professional risks—such as running up against the PC doctrine of today’s universities and academic presses; or to go much, if at all, beyond the boundaries of his (or, of course, her) academic discipline, political science in this case — integrating, say, history, philosophy, psychology, and/or literature into his considerations; or to produce mature scholarship so early in his career. Do expect diligence, however—nobody works harder than an assistant professor. In sum, I got what I expected from this book. That means a 4, perhaps 5, on a 10 scale—not bad, but it could have been a lot better. That acknowledged, this book was worth my time—in fact, I read it in a single setting. Professor Hawley thinks clearly enough (for this stage of his working life), he writes reasonably well, and he obviously devoted much time and effort to this project. I profited from his descriptions of what’s going on with the internet (the Alt-Right, he reports, is largely an internet phenomenon, much of it anonymous), about which I am clueless. I also found helpful the distinction he draws between the Alt-Right and the “Alt-Lite.” Alt-Lites he mentions include Milo Yiannopoulos, Mike Cernovich, Joseph Paul Watson, and the only two women in the book, Ann Coulter and Laura Southern. No Alt-Right women, such as Lana Lokteff of Red Ice Radio, in this presentation. The quotes in the book from Hawley’s interviews, including those with Richard Spencer, were very good, though you couldn’t prove it by me that he took in and worked with what these people actually said. As I read along in the Hawley book, I was reminded of a biography of Trump strategist and Breitbart News chief Steve Bannon by Joshua Green I read recently—Devil’s Bargain: Steve Bannon, Donald Trump, and the Storming of the Presidency (Penguin, 2017). I won’t get into the Green book in this context, but a recommendation I’ll pass along is to read it and this Hawley book concurrently or back-to-back and see what you come up with. I found the two taken together revealing. “At this point, the racist nature of the Alt-Right is well known, and it will be evident to the reader that I am not using the term to downplay this element of the movement.” Hawley has a thing about (white) racism. 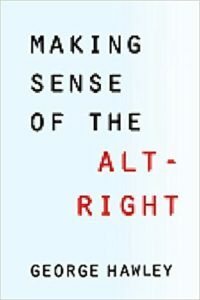 “Some have objected that mainstream journalists and academics should not even use the term ‘Alt-Right’ and should instead stick with ‘white supremacist.’ Although I understand and appreciate this argument, throughout this text I will use the term ‘Alt-Right.’” Hawley also has a thing about white supremacy. “Throughout this text, I use the term ‘white nationalist’ largely because that is the term used by many on the Alt-Right to describe themselves. But I acknowledge the critique that white nationalism was a term invented to make white-supremacist views more palatable.” White analysis, white advocacy, and white separatism aren’t arrows in Hawley’s quiver at the moment. White supremacy, that’s it, and all sharpened up; just set it in the bow, aim at the target, and shoot. “The Southern Poverty Law Center [as far as I can tell, an unimpeachable source in Hawley’s eyes], which has long monitored hate groups in the United States, describes the Alt-Right as an extremist ideology. I agree with that assessment.” Hawley’s locked into an extremist take on how to peg the Alt-Right. “I should also make clear that if the Alt-Right continues to grow in size, it may represent a serious challenge for America’s liberal democracy, and for this reason it should be understood.” Ah, the justification for investigating the Alt-Right in the first instance: the threat it poses to our guiding political ideology and form of government. Talk about a menace. Hawley puts what he calls “highbrow white nationalists”—Jared Taylor, Greg Johnson, and the editor of this publication, Kevin MacDonald—into the “larger Alt-Right family.” Therefore, whatever he says about the Alt-Right, and it’s not laudatory, applies to these three prominent figures in the white racial movement. Writes Hawley: “Jared Taylor, of the ‘race-realist’ group American Renaissance, probably agrees with Senator Bernie Sanders on very little, but his own writings on this subject (‘Since early colonial times, and until just a few decades ago, virtually all whites believed race was a fundamental aspect of individual and group identity’) clearly echo Sanders’s claim that the United States was created ‘on racist principles.’” To Hawley, race as a core aspect of whites’ identity is—you got it—racist. And then there is the late book author, columnist, and editor Samuel Francis: “Francis was the most openly racist [of the paleo-conservatives, who Hawley cites accurately if simplistically as forerunners of the Alt-Right]. His willingness to cross the line into open racism was the reason he ultimately became unwelcome in the mainstream conservative movement.” Hawley notes that Francis, the late columnist Joseph Sobran (another paleo-conservative), and the currently highly visible writer and podcaster John Derbyshire “all once wrote for mainstream conservative publications but were fired when they expressed explicitly racist or anti-Semitic sentiments.” Alt-Righters have hit the Daily Double—first place finishes in both racism and anti-Semitism. I came to the conclusion that Hawley is in fact doing some heavy-duty politically correct opining in this book. I had problems with a number of Hawley’s unsupported declarations. One example: “The Alt-Right wants more than an end to undocumented immigration or to receiving refugees from majority-Muslim countries; it wants nonwhites out of the country, whether they are immigrants or not, even if they can trace their ancestry back to the colonial period.” Really? Out of the country? Every last one of them? Some elaboration or examples would have helped me here. One person that doesn’t fit into the Alt-Right camp, Hawley informs us, is our current president: “Let me emphasize that Trump’s ideology (if it can even be called an ideology) is not the same as the Alt-Right’s. In spite of the hyperbole of some of his opponents and some of his Alt-Right supporters, Trump is not a fascist, a Nazi, or a white nationalist.” So if Trump isn’t any of that list at the end of this last sentence, and therefore isn’t Alt-Right, that means the Alt-Right is . . . well, you know. The meta-message, call it that, I took from this book is that Alt-Right people are basically no good. And given Hawley’s amorphous, inclusive take on the Alt-Right, that includes me. If I would have taken this book seriously, which in truth I didn’t, I’d be feeling bad about myself right now. I do feel good about Hawley’s chances for tenure, though. Robert S. Griffin is Professor Emeritus at the University of Vermont. His website is www.robertsgriffin.com. He invites you to read a book manuscript he recently completed available free as a PDF on his site: From Old to Elderly: A Decade of Thoughts.